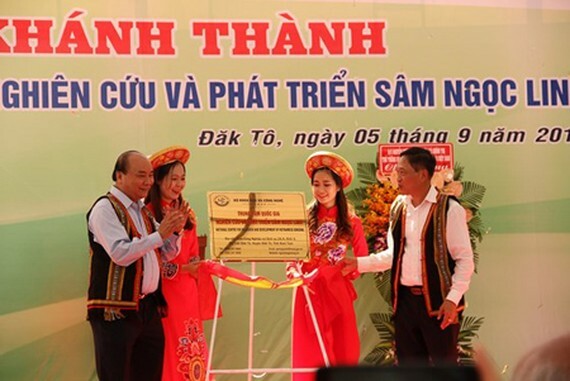 The Ministry of Science and Technology cooperated with the People’s Committee of Kon Tum province to hold the grand opening ceremony for the National Research and Development Center for Ngoc Linh Ginseng yesterday in Dak To district. According to Deputy Minister of Science and Technology Tran Van Tung, Ngoc Linh ginseng, being one of the best ginsengs in the world, is a valuable medicine that possess 52 saponin active elements. This ginseng is normally grown in forest with the height of 1,700m and over under harsh natural conditions. The new R&D Center aims at creating a favorable environment for scientists to focus on their research in order to preserve this ginseng as well as turn it to be a staple of the local area. In the event, Prime Minister Nguyen Xuan Phuc said that there must be a clear plan and the collaboration between the government, businesses, and the R&D Center in order to transform this precious national medicine into the means of living for local citizens. Perfecting the multiplication process and then widely cultivating this ginseng and building a national trade name for Ngoc Linh ginseng is an extremely meaningful task in the upcoming time. Since Ngoc Linh ginseng is now grown in both Kon Tum and Quang Nam provinces, there is a great chance for this product to dominate not only the domestic but also the international markets. The development of this ginseng means a successful commercialization process and a boost to the local economy while creating more jobs for residents. The Prime Minister also asked that the R&D Center detailed information on the value of Ngoc Linh ginseng for the propaganda task. The Center is also requested to protect the gene resource of the ginseng and to help it develop to its full potential in accordance with the strengths of Kon Tum and Quang Nam provinces. There must be a clear method to differentiate between the authentic and the fake ginsengs, a way to develop products from ginseng extract. As stated by the Prime Minister, the primary job of the R&D Center at the moment is to help local residents and businesses to tackle the problem of fake ginseng while collaborating with international scientists to research on the gene map and origin of Ngoc Linh ginseng. After that, the task of multiplication, cultivation, and manufacturing products from ginseng extract should be considered. Prime Minister Nguyen Xuan Phuc also paid a visit to a ginseng farm on Ngoc Linh Mountain, which is 2,000m above the sea level. The farm is located in Tu Mo Rong District of Kon Tum Province.